NEWARK, N.J. — The jury in the bribery trial of Sen. Bob Menendez concluded its first full day of deliberations Tuesday without a verdict, but not before asking a question that had some in the courtroom scratching their heads. A juror asked the judge Tuesday to read back part of Monday's closing argument by the New Jersey Democrat's lawyer that dealt with the definition of a senator. The judge declined, saying only testimony can be read back and closing arguments aren't testimony. Menendez is charged with accepting gifts such as flights on a private jet and luxury vacations from Florida eye doctor Salomon Melgen in exchange for political influence. An indictment alleges Menendez pushed executive branch officials to resolve Melgen's $8.9 million Medicare billing dispute and his stalled port security contract in the Dominican Republic. The juror's question could have been referring to the fact Melgen isn't a New Jersey resident. 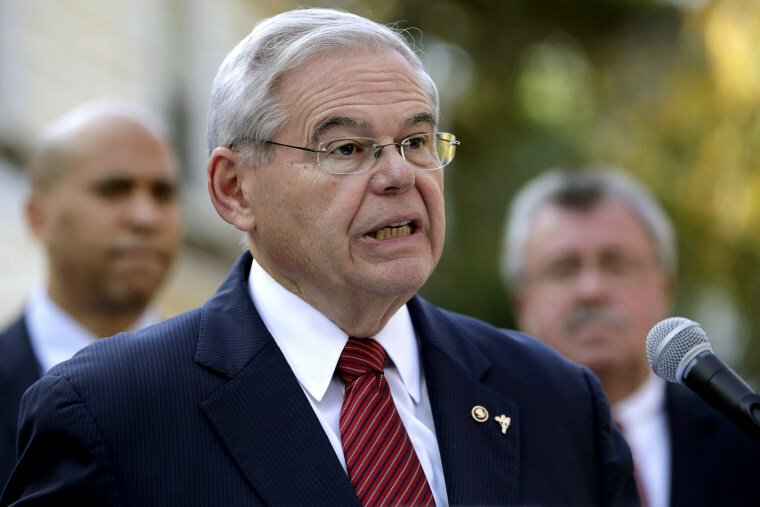 Prosecutors have argued since he wasn't a constituent of Menendez's, that showed Menendez was influenced by the alleged bribes. Defense attorneys have argued Menendez routinely helped people based on issues and not geography, and pointed to his involvement in Hispanic issues nationally. Menendez defense attorney Abbe Lowell also mentioned in his closing Monday that Menendez didn't propose any legislation aimed at helping Melgen's business interests, and didn't have the authority to force the officials he approached to act on Melgen's behalf. The case could have implications for a deeply divided Senate if Menendez is convicted and he steps down or is voted out by a two-thirds majority, though neither scenario is considered likely. If either came to pass before New Jersey Gov. Chris Christie leaves office Jan. 16, the term-limited Republican governor could appoint a replacement. A Democrat holds a comfortable lead in polls ahead of Tuesday's gubernatorial election to succeed Christie. Menendez is up for re-election next year. A 2016 Supreme Court ruling that overturned the bribery conviction of former Republican Virginia Gov. Bob McDonnell will loom over jury deliberations. The ruling created a narrower definition of what are considered "official acts" in a bribery scheme, and U.S. District Judge William Walls used language directly from the court's ruling in his instructions to the Menendez jurors. Defense attorneys focused part of their closing arguments on the requirement that the official — Menendez — has to agree to perform an official act "at the time of the agreement" to be found guilty, and told jurors the prosecution didn't present any evidence of an actual agreement between Menendez and Melgen. Prosecutors argued to jurors that Menendez's meetings with officials in the departments of State, Commerce and Health and Human Services constituted official acts that were meant to benefit Melgen specifically. Menendez's attorneys have argued the meetings focused on broader policy issues. Menendez, the son of Cuban immigrants, served in the U.S. House from 1993 until filling the Senate seat vacated when Democrat Jon Corzine became New Jersey governor in 2006.